Meigs sophomore Tucker Smith (left) and Eastern junior Dillon Aeiker (right) grapple in the 138-pound bout, during a tri-match on Thursday in Tuppers Plains, Ohio. MHS freshman John Purdue takes EHS senior Emily Bunce, during the 170-pound match on Thursday in Tuppers Plains, Ohio. TUPPERS PLAINS, Ohio — So much for beginner’s luck. 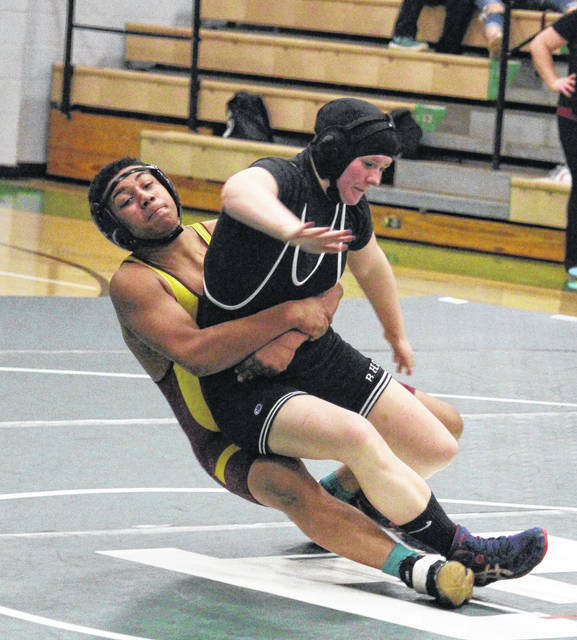 The Eastern wrestling team — in its third season of varsity action — hosted its inaugural meet, hosting Fairland and Meigs on Thursday evening at ‘The Nest’. However, it was the Marauders who felt most at home, defeating both EHS and FHS, while the Dragons claimed a narrow decision over the Eagles, who will have six days before hosting their second-ever meet. The evening began with a dual between Meigs and Fairland, which the Marauders won by a 48-18 final, with three pinfall victories and five forfeit wins over FHS. The Marauders’ pinfall wins were by freshman Griffin Buck in the 106-pound weight class, sophomore Tucker Smith in the 132-pound category and junior Jonathan Newsome at heavyweight. Winning by forfeit for Meigs were Clayton Hanna at 120, David Robson at 152, J.R. Hamilton at 160, William Smith at 182 and Brandon Justis at 182. Falling by pinfall to the Dragons were Lane Shuler in the 145 class, John Purdue at 170 pounds and Wyatt Mitchell at 220. 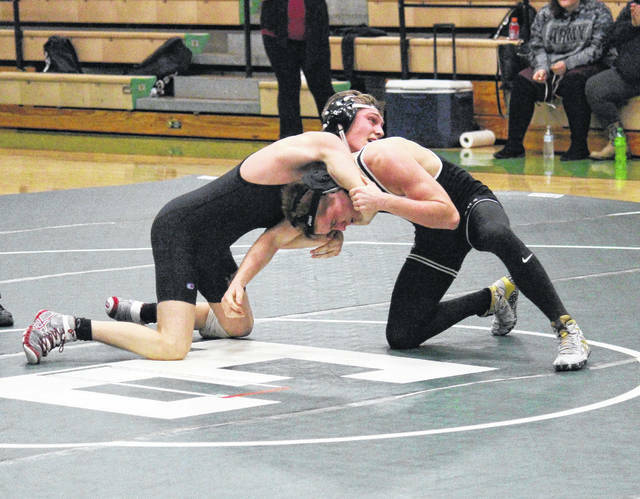 “The Fairland dual I was very pleased with,” MHS head coach Cassady Willford said. “We flattened out in the Eastern dual, but overall I’m pleased with our guys tonight. The Eagles chashed with the Dragons next, and after the dust settled, the teams were tied at 30. FHS claimed the victory on Criteria E, however, as the guests had a 3-to-1 advantage in pinfall victories. Eastern’s lone pinfall victory came from sophomore Nathan Litchfield in the heavyweight class. Winning by forfeit over FHS were Eagles Dillon Aeiker at 138, Daniel Harris at 152, Nick Browning at 182 and Steven Fitzgerald at 195. 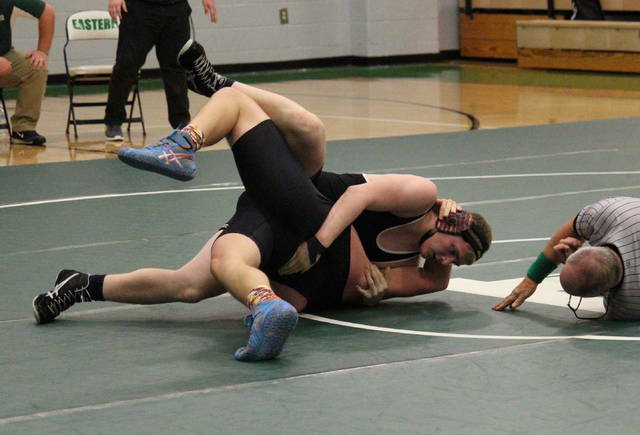 EHS forfeited 132 and 145 to the Dragons, with Eagles Eion Marcinko (106), Emily Bunce (170) and Sarah Bunce (220) falling to Fairland by pinfall. In the dual between Meigs County schools, the Marauders won by a 42-24 tally, with both sides earning four pinfalls, but the guests taking a 3-0 edge in forfeits. For the Maroon and Gold, Buck picked up a pinfall win over Marcinko at 106 pounds, Purdue earned a pinfall win over Emily Bunce in the 170 class, William Smith pinned Browning in the 182 matchup, while Newsome pinned Litchfield in the heavyweight bout. For the hosts, Aeiker won by pinfall over Tucker Smith in the 138-pound matchup, Harris earned a pinfall over Robson in the 152-pound clash, Fitzgerald claimed a pinfall over Justis at 195 pounds, while Sarah Bunce pinned Mitchell in the 220 class. The difference in the dual were the three forfeits, claimed by Hanna at 120, Shuler at 145 and Hamilton at 160. The Marauders return to the mats on Jan. 20 at the John Deno Invitational, hosted by Athens. “Sometimes you don’t look at how the team does overall when it comes to these things, being a third-year program,” said Mummey. “Meigs and Fairland are older programs, they’ve had a lot of experience over the years and we try to compare ourselves to them. Eastern will be back in action on Saturday at the Alexander Spartan Invitational.